As you can see, the current EC is 0.4 and the pending (target) value is 0.2 . • -m – the name of the managed system where the hardware resource is configured. This name must be enclosed in double quotes and in the form mmm*ssss, where mmm is the machine type and ssss the serial number of the managed system. • -p – the user-defined name of the partition on which to perform the restore. This argument must be enclosed in double quotes. • -r – the hardware resource type to restore. 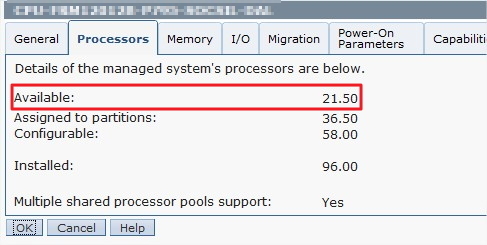 Possible values are cpu (processor), mem (memory), or slot. • -u – the processor ID of the processor to restore. • -i – the machine type and serial number of an I/O slot’s scoping drawer. This argument should not be specified if the resource type is not slot. • -s – the slot number of a PCI slot to restore. • -l – the physical location code of the I/O slot. This argument cannot be specified with the -i and -s flags. • -help – prints a help message. We can see now that the pend_proc_units are back to their original value (before the DLPAR operation), which is the target value (in our case, the same as curr_proc_units)! ← How to remove these *! @# ^M symbols at the end of each MSDOS-imported files ? !